I worked so hard recently to get an interview with an interesting local man. Sitting in the coffee shop, we exchanged friendly greetings but when he saw my pen and paper he determined that he really didn’t want to share his story with others. So I reluctantly put my tools away, knowing I’d never be able to recall and do his memories justice. We spent an enjoyable couple hours riding around in his pickup truck while he told great stories about the valley he’s lived in for 50 years and all the characters up and down the river. He’s a natural storyteller but was reluctant to share with others. While I loved the visit, I was saddened at not being able to share his wealth of experience and keen insight with a broader audience. I can only hope he at least relates these great stories to his family. teenagers working in the family chile or onion business, grandparents, unmarried young mothers determined to make a good life for their child, a poet working as a waitress at the local café, retirees sharing squash and tomato plants, an immigrant who had started her own business after supporting her young children by working in the fields, a well known musician and a pair of world class chefs running a bed and breakfast. That’s a pretty big cross section of humanity. Many, after hearing my request for an interview, said, “Oh, I’m boring; I don’t have anything to say.” A few settled right in and enjoyed talking about their lives and how they got to where they are. Sometimes folks tried to deflect to the interesting neighbor down the street or up the valley. These were fun opportunities that sometimes panned out when I could say,”Your friend at the library, post office, hardware store, sent me over and said you have some great stories to tell. Do you have time to visit?” One lovely elderly lady is the sole resident who remembers stories about the railway station and the old schoolhouse. She didn’t want to share those however and it’s a sad thing that they will probably die with her. Invariably they forgot all about the time, relaxed after a bit and just started sharing stories and “remembering the time.” There is a reason this business is called Remembering the Time—it is a universal expression human beings say that makes an immediate connection with others. It is one of the greatest privileges I know to draw those memories out and help people share their life experiences. People have so many interesting stories and experiences but they are worried/shy that others might not find them interesting so they keep quiet. The world and those they know are missing out on the intriguing occurrences that helped shape that person into who they are. These experiences shape not just individuals but in turn shape the world around us. Your story is too important to keep to yourself. Thank you, from the bottom of my big story-loving heart. What to do with that collection of old letters? I’m intrigued with creative ideas for preserving and displaying clients’ letters in ways that showcase their uniqueness. While searching for “memory arts” inspiration on Pinterest I found a pin of Sue Bleiweiss’ blog on Vintage Letter Books. She graciously gave permission for me to share this with you. Turns out this is an old blog and as an award winning fiber artist she is currently creating a variety of other gorgeous projects. Check out her website at www.suebleiweiss.com. People are often unsure of what to do with their collection of family letters. Usually letters are stored in a box or bin and it’s difficult to enjoy them easily. I’ve scanned letters into digital format and created an electronic collection something like an e-book on CD. This is a great way to have a backup of hard copy letters for preservation’ sake. However, the tactile satisfaction of holding an actual letter can’t be beat. Why not take these one of a kind letters and create your own historical family art? Sue’s idea shows you how to create stunning hard bound books from letter collections. Start with an old hardbound book of your own to get the quality cover and hand sewn spine for a project foundation. Don’t have an old book? Goodwill and thrift stores can score one for a dollar or two. learned that Mary’s birthday was July 14th and that she corresponded regularly with her grandpa who suffered a heart attack in 1942 and died shortly after. There’s a letter to her written just a couple of weeks before he died (in the photo below) in which he tells her that the Dr’s told him that spending three more weeks in bed would make him a new man. He was looking forward to listening to the Cardinals and Cubs game later that day and hoped that the Cardinals would win. Just a couple of weeks later she received a condolence letter about his death. At the time it cost only 3 cents to mail a letter and the postmarks encourage buying war bonds. In a letter to Mary from her Aunt Elizabeth in July of 43 she asks Helen if she and her mother are doing any war work and talks about a gas shortage. There is no mention of Mary’s father in any of the letters. I thought about these letters as I created the book that I bound them in and I couldn’t help wondering what became of Mary. Assuming that she was a teenager in 46 she could be in her 80’s now. I wonder where she is and what she’s doing and how her letters ended up in the hands of an Etsy seller who sold them to me. What a beautiful and inspiring way to capture your family’s history. Think what a stunning gift this would make for your parents or grandparents. I’d love to collaborate on a project like this so get in touch if you have a letter collection you’d like to showcase. I hear over and over “Oh, my life is just ordinary.” Let me respectfully say, you suffer from a lack of vision. No life is just “ordinary.” It is a gift. Read on for five themes to help you take your life story from ordinary to extraordinary. Carpe, carpe. 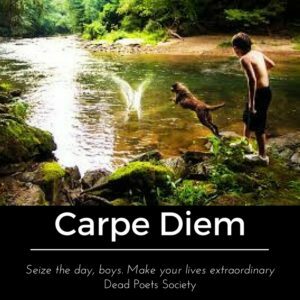 Carpe diem. Seize the day, boys. Make your lives extraordinary. All I really need to know about how to live and what to do and how to be I learned in kindergarten. Wisdom was not at the top of the graduate-school mountain, but there in the sand pile at Sunday School. People of Influence—parents, friends (enemies? ), teachers, mentors, spiritual leaders. Describe your relationship, how you met, what they taught you. Remember, we learn from both positive and negative influences—both shape you. Think about it from both sides of the coin. “No matter what anybody tells you, words and ideas can change the world” Robin Williams’ character John Keating in Dead Poets Society—challenged a group of young men to rise above apathy and make a difference. Who has challenged you to live intentionally? Childhood Stories—what was yours like?, What made it unique? Typical? Experiences and people that stood out. Think about the novel To Kill a Mockingbird. While fiction, it takes a brief time period in a young girl’s life and expands, becoming something greater n the process that transcends all of life and continues to impact people to this day. Travel Memoirs—travel grows us and changes our perspective, expands our world. Pull out photos and journals; think back on the places you’ve been and the people you’ve met. What have you learned? Think beyond international travel. Mark Twain was a master at gleaning great stories from travels and observations just within the United States. You can even micro-focus—adventures around your own state or a close-up look at a lifetime’s experiences within your own city. Ramp up your sense of the curious and really study the people and events that have shaped who you are. Life Letters—often illuminating. These can be letters you’ve written or those sent to you. Life details and emotions expressed in these letters are a snapshot of a different time, a different you, that although past, have shaped who you are now. Your life has been full of unique experiences that have changed you, challenged you, given you the skills and tools you need to survive and thrive. Your voice is there—if you haven’t found it yet, begin now. Your life matters. Make a difference. Share what you’ve learned—pass it on! Need some help finding the extraordinary in your own life? Contact me for a fresh perspective and coaching on how to communicate your story. Mentoring and apprenticeships used to be a common method for teaching people new skills. They might go by different names now but they are never out of style. Do you realize that family and friends are custom designed for skill sharing? What does this have to do with memories? Tons—many of our most memorable moments happen while learning to do something. ♦Hiking—of course the how-to’s of packing everything you need for a week. But more than that, pulling up the grit and determination to keep going. ♦Building a fire—super important life-skill. Whether or not you ever go camping or have a fireplace. In the zombie apocalypse you’re going to wish you knew how to do this! ♦Shooting—why it is important to keep the scope away from your eye when pulling the trigger. Keep yer eyes open when you aim! ♦Fishing—the proper application of salmon eggs, how to twitch a lure, how to land the hook where you mean to, not in the brush. How to prepare said fish for eating. ♦Building a wall—yeah, sorry for knocking it down Dad, but thank you for teaching me basic masonry skills, and how to handle a crisis with grace! ♦Babies and Children—proper care and feeding, how to calm a fussy one. How to love well. Try making your own list and jot a note beside each item of the memory it prompts. You don’t have to be an expert. Just try. Adding a new skill will make you more interesting, you’ll strengthen relationships and stretch your brain synapses. It’s said that learning new things keeps you young and it definitely keeps you from being bored or boring. What new skill are you going to learn or teach this summer? Share this inspiration with your friends and family to start –or continue—some great mentoring relationships. For the Love of Picnics! We’ve all heard of or remember the famous church picnics and really, who doesn’t love a good potluck? I don’t know why but food tastes extra good outdoors. Across the US many annual pioneer picnics and family reunions have been going on for over 100 years. Biscuits, fried chicken, ham, lovingly protected cakes and a glorious array of pickles used to be standard fare. Today many of the same favorites show up along with some Pinterest “experiments” and gourmet goodies. But relatives still vie over who makes the best potato salad or brownies. If you’re here in New Mexico looking for a new place to hold your next picnic check out this wonderful round-up of Best Picnic Places by author Juliet White. What’s on my family’s picnic table? Pretty much the same thing we have every year. My kids don’t want the menu changed. Dad’s grilled chicken, Great Grandma’s famous clam dip, blueberry cream cheese dessert, chile con queso, potato salad (thi s is where I insist on experimenting). It’s a mix of Southern, New Mexico and Pacific Northwest, reflecting our family heritage. What does your menu look like? What kind of fun does your family make? Enjoy this Independence Day as you celebrate with family, food and fireworks. Share a favorite recipe from picnics past or a great 4th of July memory.